Miriam Bonici has been part of the faculty here at the Academy since 2011. She taught third grade until 2015 when she became the Early Childhood Coordinator. 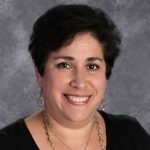 She previously taught in the New York City Public School system for nine years in several positions both as an ESL , and a first grade teacher. She spent five years teaching second grade at East Hills Elementary School in Roslyn before taking a leave to raise her son. She recently received her professional degree in School Building Leadership. Miriam has enjoyed being part of the Academy family since its start both as a parent and teacher.